Technology is an integral part of modern life. Developing technological skills is an essential component of progressive education. We have seen how the iPad tablet enhances learning and helps engage students in new and creative ways. The iPad feeds students’ curiosity. These devices reinforce real-life skills, such as researching, collaborating, keyboarding, organizing, and communicating ideas. Students are able to access information efficiently, which helps them analyze and solve problems together. We see that the iPad inspires creativity and promotes a deeper understanding of the world in which they live. 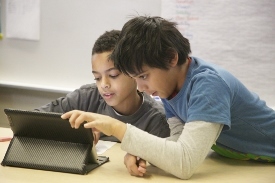 The iPad offers opportunities to teach real-world lessons in using technology ethically and proficiently. It also offers countless opportunities for students to practice being critically and socially engaged. While this tool will never replace manual, hands-on experiences and teacher-student collaboration, it can deeply enrich those experiences. The Green Acres 1:1 Program demonstrates how technology can help facilitate authentic teaching and learning experiences, while preparing our Middle School students for the world they will inherit.